One of the best free newsletter plugins readily available for WordPress is the Newsletter. At present, featuring well approximately 200,000 downloads. This plugin supports in sending unlimited emails and lets you have unlimited subscribers in a successful manner. It helps to create mobile-ready newsletters and Feature-rich drag-and-drop responsive email composer. It’s another popular and one of the best free WordPress email subscribers plugin. The real goodie here is that most of its features and functionalities are available for free. It does packs premium version, for both individual and agency, adding premium extensions to the table. 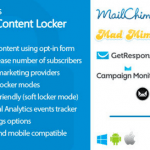 It supports unlimited emails with tracking and subscribers which are a rare feature. It is also ready to work with SMTP. It supports both HTML and text versions of emails and can work automatically to send the updates to subscribers. It is perfectly integrated with the WordPress user registration system. It even supports active translation, and the emails are translatable, thanks to the available .po and .mo files. It can be implemented via either widget or contact form or even via a dedicated page.